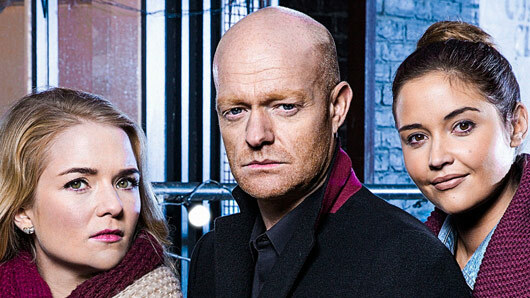 The eagerly-awaited EastEnders Christmas trailer is here! The trailer begins with the residents of Albert Square having a jolly good time in the Queen Vic, but that lasts about as long as you’d expect. We next see the situation at the Mitchells escalate, as the family try to grant dying patriarch Phil Mitchell the best Christmas ever – only for him to fall horribly ill during the festivities. Elsewhere, we see the happy Jack and Ronnie, celebrating Christmas with their children as Roxy does the walk of shame back home. It’s EastEnders, however, so Jack and Ronnie’s happiness won’t last long. Finally, the trailer ends with Stacey being surprised by a Merry Christmas from a resident who she hasn’t seen in more than a year – the returned Max Branning. It’s going to be an eventful Christmas on EastEnders.